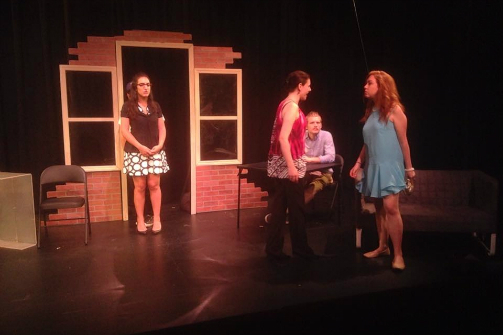 Bianca Valle, Lisbeth Russell, Jacob Corbett, MacKenzie Nehme in O'Brien & O'Brian. Photo by J. Enright. BOTTOM LINE: Can two half-Irish lawyers successfully take on a lawsuit and win? When it comes to Irish last names, O’Brien and O’Brian are fairly common ones. Two lawyers who were law school classmates—Darlene O’Brien (Bianca Vitale) and Alan O’Brian (Jacob Corbett)—decide to share an office space despite the confusing last names. Even with a line drawn down the middle of an office, clients still wander in asking who is who. One client, Sam (John Mervini), does not seem to care who O’Brien or O’Brian are. Sam has been dealing with a lawsuit from the EPA, saying that he has illegally constructed a pond at his vacation home. Since he is not there all the time, he has no idea how it got there. His full blooded Irish wife, Maeve (MaKenzie Nehme), may know a bit more. The two have recently separated and Maeve took the vacation house. She says that it wasn’t Sam who built the pond but “rats with flat tails,” one of which she actually caught. This revelation changes the case completely, and the EPA representative, Brenda (Lisbeth Russell), is brought in in the hopes of dropping it completely. But more fuel is added to the fire when Brenda reveals she and Darlene were in a relationship while Darlene was in law school. As someone who comes from an Irish family, I found myself relating to the rows in this play very much. There was also something about the Irish-phobia tagline that caught my eye. While not the center of the show, there are definite moments where Brenda clearly has misgivings about Maeve. Maeve, who is the typical Irish woman complete with red hair, may be a tad bit overdramatic, but she gets her point across loud and clear in terms of the lawsuit and also her romantic intentions towards her ex-husband. It seems that the only reason Brenda has a problem with Maeve in the end is because she is not afraid to stand up for herself while Brenda clearly has some work to do in this area. The dramatics clearly drive the storyline here. Sometimes it is a bit much, but overall O'Brien and O'Brian is quite engaging. The story flows well despite the many side plot, although I wish some had been delved into more, like Maeve’s far from enthusiastic reaction when Brenda reveals her romantic history. The sarcastic air to John Enright’s script is also a nice surprise. It's on the lighter side but with the right amount of seriousness. The ending may have been almost too happy for such a complicated story, but all in all this play works well.